Randall and Beth are in their bedroom, and Randall tries to talk to her but Beth cuts him and yells at him about the message he left her. He tries to explain that he didn't mean it, and he just feels their rhythm is off. Beth thinks the only issue is that he doesn't like that she's not giving into what he wants. 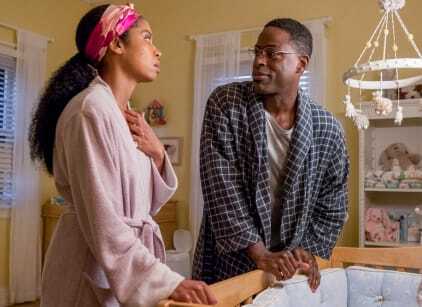 Randall tries to deny that, but Beth tells him that everything she does or accomplishes always ends up being about him. She says they've been having the same fight since they first met. Randall approaches Beth at the college orientation and bumps into her. She accepts his apology and moves along. Randall talks to Kevin on the phone about Beth, and Kevin convinces him to call Beth and ask her out and keep him on the other line so he can tell Randall what to say. Randall freaks out when she answers the phone, but Kevin feeds him some lines to use. Beth eventually accepts her date request. Randall takes her to a fancy restaurant and asks her some questions that she wonders how he knew this information. He admits he asked around about her. Randall tells her about his adoption and how Jack died. Beth tells him that her dad died last year as well. Before they can continue talking, a waiter asks them to pay for their bill before they order. Randall is about to pay before Beth tells him that they are not eating at this restaurant. Outside the restaurant, she tells Randall that he's a lot to handle and he went way too over the top for this date. Randall tries to get her to stop trying to pick a fight with him but ends up making it worse after bringing up his parents. Randall tells her he just wanted to give her a great first date because she deserves it. Beth tells Randall that he's nice, but asks him not to call her again. Randall arrives back at his dorm room and when his roommate asks him about the date Randall tells him he's going to marry Beth one day. Beth finds the cheque that Randall was going to use at the restaurant in her coat pocket and smiles. Randall dances to "Let's Get Married" in front of Beth and proposes to her. She tells him not yet and he's just glad that he's getting closer to a yes. She tells him he's it for her, but she's just not ready to get married. Beth asks Randall if they cannot do Sunday dinner tonight and instead go mini golfing. Randall invites his mom to tag along, not getting Beth's hint. At mini golf, Beth asks Rebecca if she's interested in seeing anyone, but Rebecca shuts her down. Rebecca drops a hint about Beth eventually accepting Randall's proposal. When Randall arrives, Beth asks him if he's told his mom about the proposal. She tries to have a conversation in private, but Randall insists Rebecca can stay and listen. Beth admits she's worried about having her life be consumed by her husband. Randall angrily tells her she doesn't have to worry about him proposing anymore and walks off. Rebecca sits with Beth who tries to apologize but Rebecca tells her not to and that she's glad Beth isn't a wallflower. She promises Beth that Randall won't let her be consumed by him. She tells Beth a story about Randall as a kid and how he felt small in the universe. She tells Beth that Randall called her when he met Beth and told her he was no longer scared of feeling small. Beth takes Randall to a dive bar and orders some nachos and ginger beer. She tells him that she's ready to be proposed to and this how she wants it to be done. Randall pulls out the ring and Beth makes him swear that they won't lose themselves, and they will always remain a team in their marriage. Randall gets on one knee and proposes to her and she says yes. Kate checks in on Beth in their new house and sees if she's ready to get married. Beth admits she hasn't finished her vows and tries to finish them quickly. Kevin checks on Randall whose vows are six pages long. He recommends Randall cut it down and while he's reading them he realizes he never mentions Beth in his vows. He asks Kevin to help him stall. Kate and Kevin meet up in the hallway and he tells her that Randall's rewriting his vows. Beth overhears and storms Randall's room, forcing him to close his eyes. She gets mad at him and says she's been planning this wedding on her own. He asks if she thinks that true, but she says no she's just stressed. Beth suggests they write the vows together. They share their vows at the wedding which brings everyone in the audience to tears. Randall wakes up in the middle of the night to check on Tess. Beth wakes up too and gets mad at him for using the wrong wipes. They get into an argument, but then forget what they are fighting about. Randall suggests they have some nachos. They talk about their worst fears they have for their baby. Beth worries about going back to work and Tess forgetting her. Randall tells her they will find a way to make it work. Beth says that usually means she's the one who has to make it work and make the compromises. Randall tells her that's not true. Beth uses the nachos metaphorically to try to explain to Randall that she feels like he leaves her to sweat the small stuff. He gets upset, but she tells him she doesn't even know what she's saying and she's just tired. Randall, William, and Kevin are hanging out and Beth tells them that she's going to a conference for the day and won't be back until the next day. William and Randall are in the car and they talk about Jesse. Randall tells William that he should communicate with Jesse more like he and Beth do. They stop at a grocery store and Randall sees Beth. He asks her why she's not at the conference. Before she can answer he guesses that she wanted to spend a night alone at a hotel. She tries to explain that she needed time to herself away from a house full of men. Randall tells her he gets it but asks why she didn't ask him first. She tells him she has asked but by the time she explains herself to him she's to exhausted to do anything. He's worried that she's running away from him but she swears that's not the case. He tells her it's okay with him, but she tells him that she doesn't want to do this fun stuff without him. Beth tells Randall that he's turned her into his mother. Someone who is able to be sweet-talked into doing whatever he wants. She tells him to admit that he thinks his job is more important than hers. Randall says he won't speak that way to her. Beth says she broke the promise they both made that they wouldn't get lost in each other and she says he let it happen. She tells him that she finally has something that she loves, and she's not going to give it up this time, and that's the problem between them. She says their lives don't work unless she does the bending. She says she doesn't want him to give one of his speeches right now because they always have her eating out of the palm of his hands. He tells her that he's not going to go along with this revisionist history and doesn't believe that he's been steamrolling her all these years. He says he won't be blamed for her finding her dream 20 years too late and she knows he would've been supportive if she founds this new passion at any other point in their marriage. She asks when she would've been able to do that when she was dealing with his anxiety attacks. Beth tries to apologize, but Randall walks away and tells her he's going to Philly and he's all out of speeches. Beth lies on the couch as she stares at their empty bed.